Who: Anyone going to the hospital or facing surgery, those in danger of death, advanced age or sickness. When: Call Church office to make arrangements for priest to come to hospital, home or at Church. 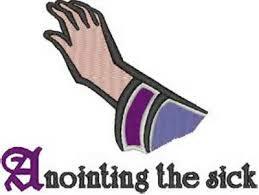 Healing Masses are held twice a year (Spring & Fall) where the Sacrament of the Sick is given. Refer to parish bulletin for exact dates and times.